Naturalizing bulbs are seasonal growers, some like warm, hot weather while others like cooler weather, less sunlight, shorter days. The growth of bulbs is triggered by soil and air temperatures followed by blooming at the right time chosen by the bulb, and collecting energy prior to dying down in order to resprout the following season. We refer to all as bulbs but some could be rhizomes, corms, or tubers. The key point is the word “naturalizing” which is “of nature” and “adapting to the garden home”. 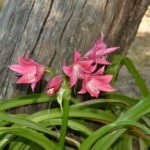 Naturalizing bulbs are deciduous and die down after blooming, while perennial bulbs have foliage year round like Crinum, Amaryllis, and Agapanthus. 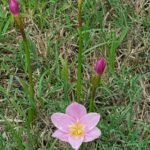 Naturalizing bulbs listed in this article will adapt to our Gulf Coast climate which includes Zone 9a soil and air temperature, and Zone 9a moisture and rainfall. The one key to growing bulbs successfully is having soil with air channels and we make that happen by working expanded shale into our heavy, clay soils. It is also beneficial to amend sandy soils with organic matter or compost combined with shale. You can plant seasonal bulbs in your flower beds, but when they go dormant you don’t love them so much anymore. We overplant the bulbs; we cut them in half with our shovels, so how do you have a nice garden of bulbs and every other plant you love? You create a rock garden around your shade tree that you cannot grow anything else there anyway! Hopefully your shade tree is deciduous in the winter to allow winter sun for the spring blooming bulbs. 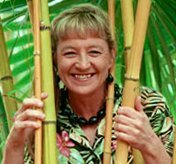 So what do you grow in rocks and roots? Well of course plants that have specialized nutrient “storage systems” such as bulbs, corms, tubers, or rhizomes. Gardeners generalize and refer to all as “bulbs” for the ease of conversation. 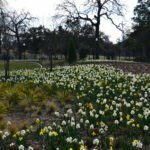 Now the term “naturalizing” means the bulbs will sprout, grow, and bloom, year after year. As a side note, this is a great place to experiment using succulents! When developing a soil mix for the rock garden, use expanded shale, compost, and bedding mix along with an organic fertilizer. In a 10’ x 10’ area use 40 lbs. of Arbor Gate fertilizer that will feed the tree, the new soil and the new plants. Use great care to not pile soil up on the base of the tree, and leave the flare roots exposed on top. The organic fertilizer will help the tree roots go deeper, allowing you some more space to work in the bulbs. 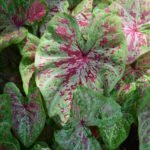 Summer growing and blooming plants emerge when the soil temperature is consistently 70 degrees and in part shade, warming up takes longer. 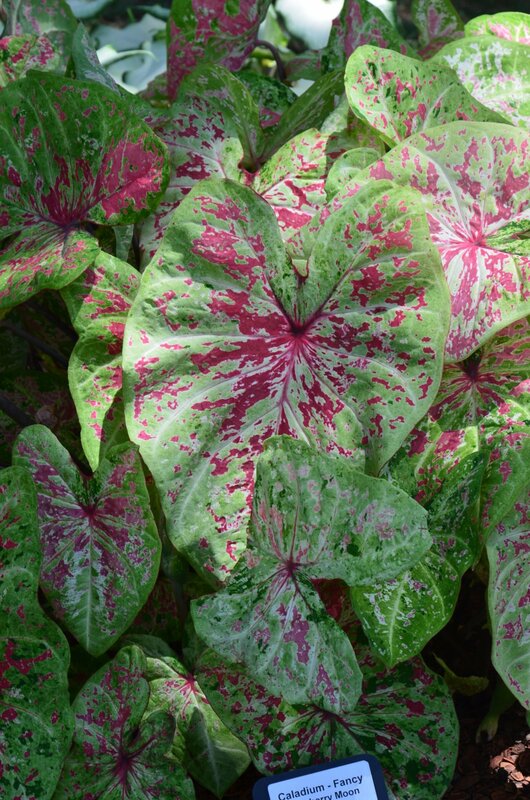 Caladiums are grown for their colorful foliage as their leaves resemble elephant ears (fancy leaf) or angel wings *strap leaf)! The first cool front (haven’t had one of those in a while) will cause the plants to lie on the ground and start going dormant. 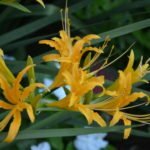 Montbretia or Crocosmia belong to the Iris family and multiply underground with corms producing orange, yellow or red flowers. Kaempferias or peacock gingers are lovingly called the Hosta of the South, because Hosta doesn’t thrive here due to our warm winters. 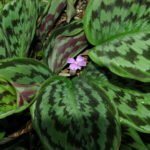 On the other hand, these rock pocket plants display colorful leaves with the striking contrast colors of silver, black, green, and purple topped off with purple iridescent blooms. 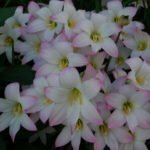 Rainlilies include Zephyranthes and Habranthus and bloom after a rain. Some species are sterile, while others reseed, so be careful about planting re-seeders in a small space. I like to pull off the seed heads and disperse into the lawn area and one day you will drive in and have one flower waving at you in the lawn! After planting this group of bulbs, they start to grow and you have foliage all winter long adding to the fullness of the space. Lycoris is one of my favorite fall bloomers and flowers before the foliage hence the name Naked Ladies! 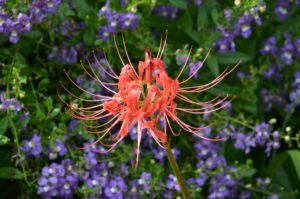 There are several forms of this group, but the two most popular varieties are Lycoris radiata which is red and Lycoris aurea, a beautiful golden yellow. Narcissus produce single stalks with multiple flowers on the stalk. Some of the popular naturalizing Narcissus are ‘Grand Primo’ and ‘Erlicheer’ (double form of ‘Grand Primo’). Spanish bluebells also called Roman hyacinths are great naturalizers for shaded spaces producing pink, blue, or white bell shaped flowers on 6-10” stalks. Paperwhites always come at the right time, great for forcing and giving as gifts around the holidays. 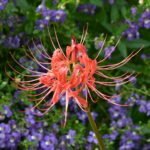 Once bloomed, they can be planted directly into the garden for a new bloom next spring. 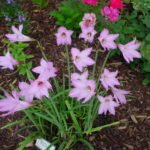 A general rule of thumb when planting naturalizing bulbs is to plant the bulb twice the depth of the bulb. Example: If the bulb is 1.5” from nose to root, plant it 3” from the bottom of the hole to the top of the soil. So time to scope out your new rock garden and get growing!